A friend's daughter married several months ago and in June several members of her husband's family will be visiting for the first time from overseas. 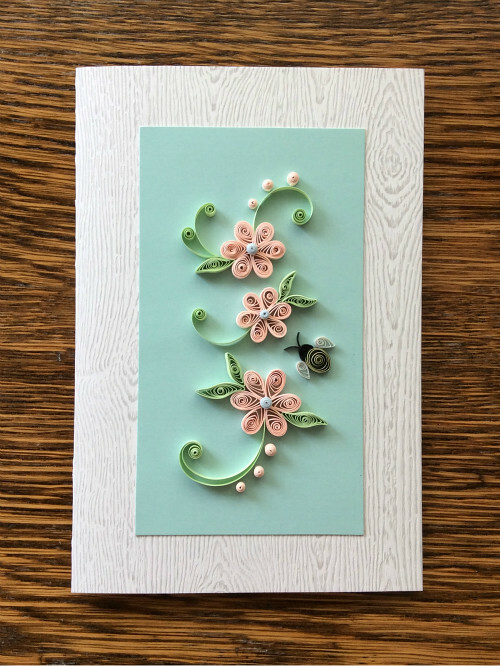 My friend wanted to have special presents on hand that could easily be packed for their return trip, so asked me to make quilled pieces that she could frame, and also a card. 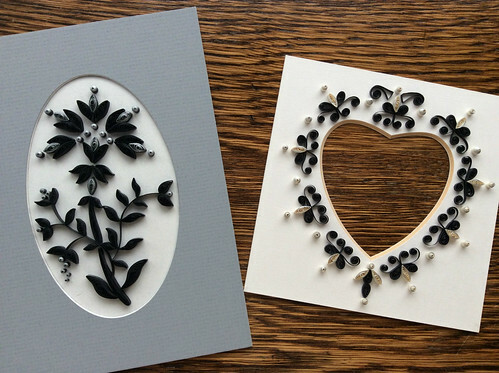 She and the bride decided on these two silver and black pieces I had made some time ago. 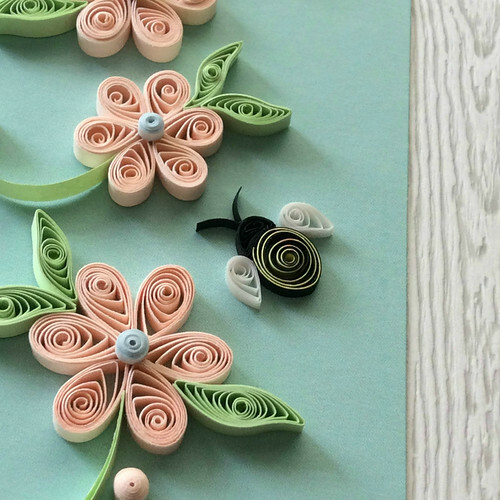 They were projects I did while testing out different brands of metallic-edge quilling strips... as it turned out, I liked both. For the piece on the left, I used Touch of Silver strips from Lake City... the shine is muted, but pretty. For the heart-shaped mat that will hold a wedding photo of the couple, I used JJ Quilling Design strips that have a brilliant shine. The third piece is a new card made to fit a standard 4 x 6-inch frame. Gmund wood grain paper is remarkably sturdy with a tactile grained surface. Peach blossoms are the state flower here in Delaware, so we decided on peach colored flowers with a little metallic gold and black bee as a nod to the beehives that the groom's family tend in Bosnia. I hope they'll enjoy having these pieces as mementos of their trip to the U.S. 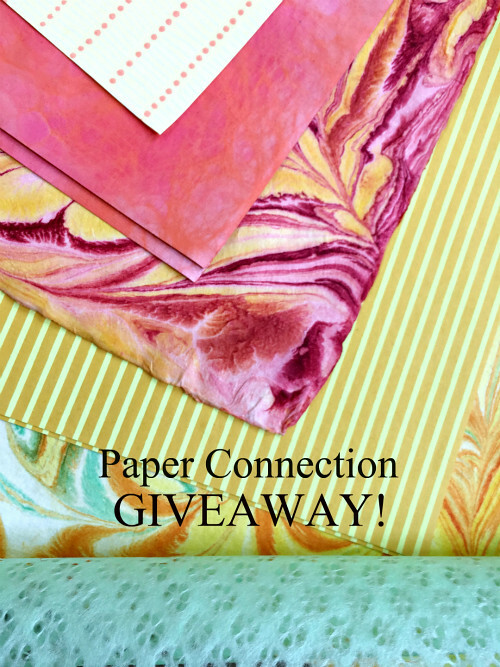 If you're on Instagram, head over to this week's giveaway to take a chance on winning this beautiful Hot Baker's Dozen collection of large decorative paper sheets from Paper Connection, supplier of specialty paper items from around the world. This is a U.S. giveaway through Saturday, May 12. Paper Connection is offering a coupon code for All Things Paper readers to use when making a purchase May 7-11, 2018. Type in ATP10 for 10% off your order, not including shipping and handling. Customers outside the U.S. please email your order to paperexperts@paperconnection.com. It will be invoiced via Paypal with the most economic and safe shipping method to your location.